If you live inside the city limits, Trees Atlanta will give you up to 3 free trees for your front yard and even plant them for you! It’s part of Trees Atlanta’s NeighborWoods program. Check it out and sign up for your trees at www.treesatlanta.org/freeyardtree. These are all wonderful shade trees free for the asking! Now how can you beat that? While you are on their site, please consider signing Trees Atlanta’s Canopy Alliance Pledge (www.treesatlanta.org/pledge). 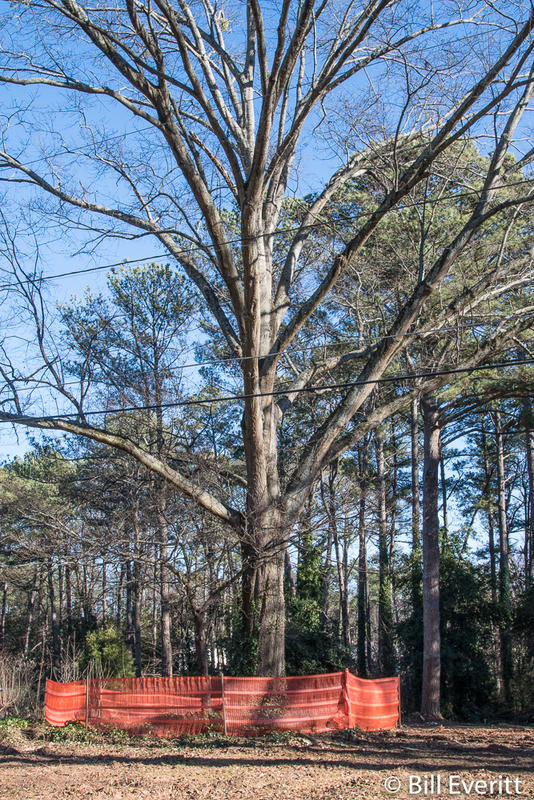 These signatures will show Atlanta’s policy makers and influencers your support for protecting our urban canopy! It only takes a minute, costs nothing and will really help. Another piece of good news is shown in the photo to the left. It’s a picture of a tree-save fence around a wonderful White Oak on Darlington Rd. We estimate the Diameter at Breast Height (DBH) between 36 and 42 inches, making the estimated age about 100 years! The owners were very careful to make sure that the new house will be situated to save this tree. Given the recent spate of clear cutting, it’s a very encouraging sight. Not only the tree is being saved, but so are the countless birds and critters that depend on it. Photos below show some glamour shots as well as birds enjoying this magnificent tree. Thanks to the owners, and welcome to Peachtree Park! Future posts will report on the neighborhood’s efforts to significantly improve tree preservation. In the meantime, you can add to our canopy and increase your property value with free Trees Atlanta trees. This entry was posted in Conservation, Trees, Trees Atlanta and tagged Cooper's Hawk, Red-bellied Woodpecker, White Oak on February 2, 2017 by beveritt. Good people on your neighborhood who are protecting the white oak. TLH is giving people in the city 3 “trees” ( less than 2 feet tall I think) to plant. In years past they were actually planting trees around Arbor Day for city people.